Motcombe Primary School is a Voluntary Aided Church of England Primary School, and Religious Education is an important part of the curriculum. Religious teaching follows the Dorset Agreed Syllabus and through this we aim to foster important moral and social attitudes such as caring, sharing, tolerance and respect for other people, a sense of concern for the environment, as well as providing a good, sound knowledge and awareness of the Christian faith. Children are encouraged to reflect on their own lives, the lives of others and to explore their own thoughts and actions. Although the emphasis is on Christian teaching, the children also begin to develop an understanding of other world faiths. Visits to places of worship are encouraged and visitors, who can share with the children the practicality of living out their faith and what it means to them, are invited into the classroom. Each year the children are encouraged to raise funds for different charities. We are pleased to announce that we will be following the new Understanding Christianity scheme from September 2017. This allows for deeper and more rigorous teaching and learning about the Christian faith. This will compliment lessons about various Christian festivals (such as Harvest, Christmas and Easter) as well as learning about other faiths and their importance. 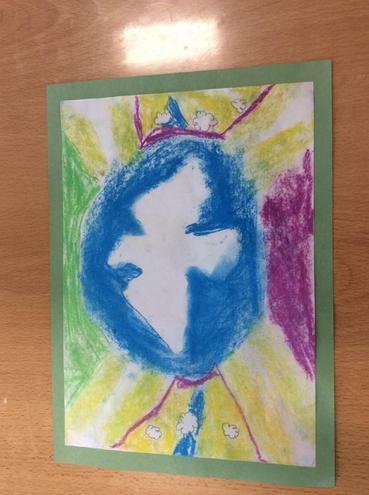 Year 1 - What would a Christian do? We thought about how Christians would help others in different situations. 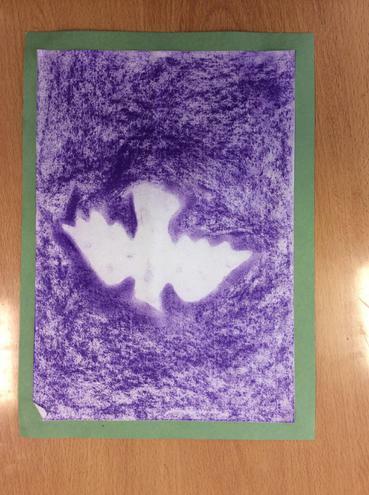 Year 3 worked with the wonderful Mrs Lewis to think about the importance of Pentecost. 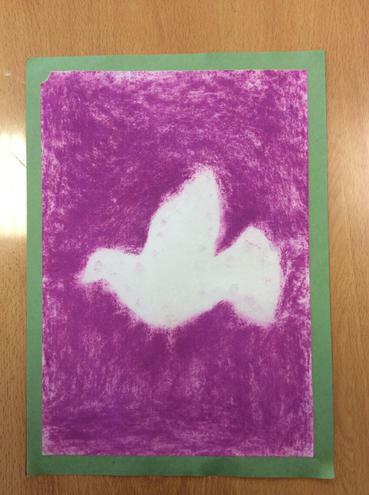 They created beautiful pastel artwork, origami doves and put together an interesting whole-school assembly to share their learning with us. 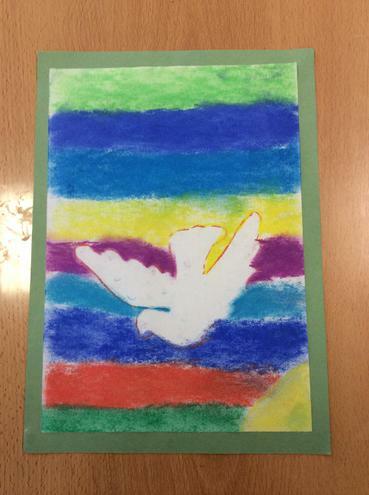 Dove Class's whole-school assembly about Pentecost. We have been writing our own personal messages to Jesus as we reflect on the Christmas story. Volunteers from Skylarks were very helpful during collective worship this afternoon. They acted out the story and joined in with speaking parts. Wrens have been exploring kindness in Bible stories this half term. We wrote kindness prayers and displayed them on our reflection tree today. Volunteers from Wren Class enjoyed taking part in our 'Open the book' collective worship this week. We found out about the church during 'Church Experience' week and visited lots of different stations to help us. Year five children planned and delivered their own worship on Pentecost to the whole school. Each class studied a story from the Bible. 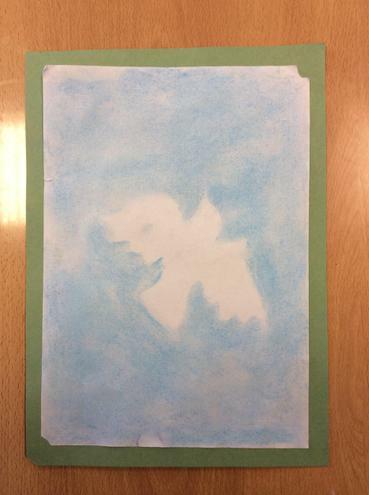 We shared our stories through art work, creating mod roc canvas pictures. They are displayed in the corridors of our school. We shared our learning on The Trinity with members of the local community by placing a display board into St Mary's Church to show how thoughtful and reflective our children are. Whilst learning about Sikhism we listened to the story of The Milk and The Jasmine Flower, we then held a reflection time where we placed our own jasmine flowers into a bowl of water. We made people from the Christmas story out of clothes pegs and children have been using them on our Reflection Table to retell the Christmas story. Ducklings children ventured into church for a treasure hunt this morning and were intrigued by many secret doors, the organ and piano. We used the story of St.George to learn about courage today. The children couldn't wait to explore the church; they were particularly fascinated by the organ and pulpit and were keen to climb the steps. One child even burst into song! We donated food to Gillingham Food Bank following a whole school Harvest Festival where songs were shared, poems were read and art work was celebrated. Children grew sunflowers in the Spiritual Garden and enjoyed looking after them as they got taller and taller! They made the Spiritual Garden a really bright and happy place to spend time!